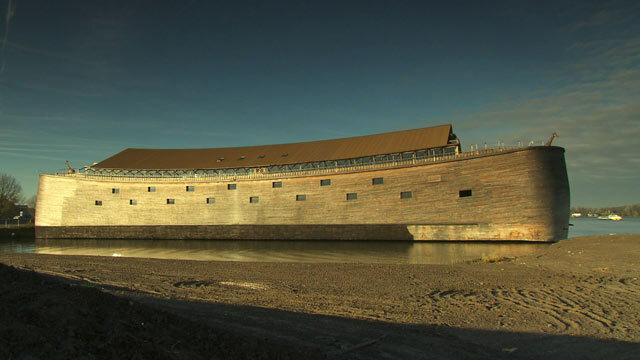 The story of Noah's Ark and the Great Flood is one of the most famous from the Bible, and now an acclaimed underwater archaeologist thinks he has found proof that the biblical flood was actually based on real events. In an interview with Christiane Amanpour for ABC News, Robert Ballard, one of the world's best-known underwater archaeologists, talked about his findings. His team is probing the depths of the Black Sea off the coast of Turkey in search of traces of an ancient civilization hidden underwater since the time of Noah. Ballard's track record for finding the impossible is well known. In 1985, using a robotic submersible equipped with remote-controlled cameras, Ballard and his crew hunted down the world's most famous shipwreck, the Titanic. "Where I live in Connecticut was ice a mile above my house, all the way back to the North Pole, about 15 million kilometers, that's a big ice cube," he said. "But then it started to melt. We're talking about the floods of our living history." The water from the melting glaciers began to rush toward the world's oceans, Ballard said, causing floods all around the world. "The questions is, was there a mother of all floods," Ballard said. "We went in there to look for the flood," he said. "Not just a slow moving, advancing rise of sea level, but a really big flood that then stayed... The land that went under stayed under." Four hundred feet below the surface, they unearthed an ancient shoreline, proof to Ballard that a catastrophic event did happen in the Black Sea. By carbon dating shells found along the shoreline, Ballard said he believes they have established a timeline for that catastrophic event, which he estimates happened around 5,000 BC. Some experts believe this was around the time when Noah's flood could have occurred. "It probably was a bad day," Ballard said. "At some magic moment, it broke through and flooded this place violently, and a lot of real estate, 150,000 square kilometers of land, went under." "In the early chapters of Genesis, people live 800 years, 700 years, 900 years," said Rabbi Burt Visotzky, a professor of Talmud and Rabbinics at the Jewish Theological Seminary in New York. "Those are mythic numbers, those are way too big. We don't quite know what to do with that. So sometimes those large numbers, I think, also serve to reinforce the mystery of the text." Some of the details of the Noah story seem mythical, so many biblical scholars believe the story of Noah and the Ark was inspired by the legendary flood stories of nearby Mesopotamia, in particular "The Epic of Gilgamesh." These ancient narratives were already being passed down from one generation to the next, centuries before Noah appeared in the Bible. "The earlier Mesopotamian stories are very similar where the gods are sending a flood to wipe out humans," said biblical archaeologist Eric Cline. "There's one man they choose to survive. He builds a boat and brings on animals and lands on a mountain and lives happily ever after? I would argue that it's the same story." Scholars aren't sure if the biblical flood was larger or smaller than these modern day disasters, but they do think the experiences of people in ancient times were similar to our own. "If you witness a terrible natural disaster, yes, you want a scientific explanation why this has happened," said Karen Armstrong, author of "A History of God." "But you also need to something that will help you to assuage your grief and anguish and rage. And it is here that myth helps us through that." Regardless of whether the details of the Noah story are historically accurate, Armstrong believes this story and all the Biblical stories are telling us "about our predicament in the world now." Back in the Black Sea, Ballard said he is aware that not everyone agrees with his conclusions about the time and size of the flood, but he's confident he's on the path to finding something from the biblical period. "We started finding structures that looked like they were man-made structures," Ballard said. "That's where we are focusing our attention right now." At first Ballard's team found piles of ancient pottery, but then they made an even more important discovery. Last year, Ballard discovered a vessel and one of its crew members in the Black Sea. "That is a perfectly preserved ancient shipwreck in all its wood, looks like a lumber yard," he said. "But if you look closely, you will see the femur bone and actually a molar." "The oldest shipwreck that we have discovered so far of that area is around 500 BC, classical period," Ballard said. "But the question is you just keep searching. It's a matter of statistics." Still, Ballard said the find gives him hope that he will discover something older "because there, in fact, the deep sea is the largest museum on Earth," he said. Ballard does not think he will ever find Noah's Ark, but he does think he may find evidence of a people whose entire world was washed away about 7,000 years ago. He and his team said they plan to return to Turkey next summer. "It's foolish to think you will ever find a ship," Ballard said, referring to the Ark. "But can you find people who were living? Can you find their villages that are underwater now? And the answer is yes." Tune in to Christiane Amanpour's two-part ABC News special, "Back to the Beginning," which explores the history of the Bible from Genesis to Jesus. Part one airs on Friday, Dec. 21 and part two on Friday, Dec. 28, both starting at 9 p.m. ET on ABC.